Manufacturing of miniaturized high activity 192 Ir sources have been made a market preference in modern brachytherapy. The smaller dimensions of the sources are flexible for smaller diameter of the applicators and it is also suitable for interstitial implants. Presently, miniaturized 60 Co HDR sources have been made available with identical dimensions to those of 192 Ir sources. 60 Co sources have an advantage of longer half life while comparing with 192 Ir source. High dose rate brachytherapy sources with longer half life are logically pragmatic solution for developing country in economic point of view. This study is aimed to compare the TG-43U1 dosimetric parameters for new BEBIG 60 Co HDR and new microSelectron 192 Ir HDR sources. Dosimetric parameters are calculated using EGSnrc-based Monte Carlo simulation code accordance with the AAPM TG-43 formalism for microSlectron HDR 192 Ir v2 and new BEBIG 60 Co HDR sources. Air-kerma strength per unit source activity, calculated in dry air are 9.698×10 -8 ± 0.55% U Bq -1 and 3.039×10 -7 ± 0.41% U Bq -1 for the above mentioned two sources, respectively. The calculated dose rate constants per unit air-kerma strength in water medium are 1.116±0.12% cGy h -1 U -1 and 1.097±0.12% cGy h -1 U -1 , respectively, for the two sources. 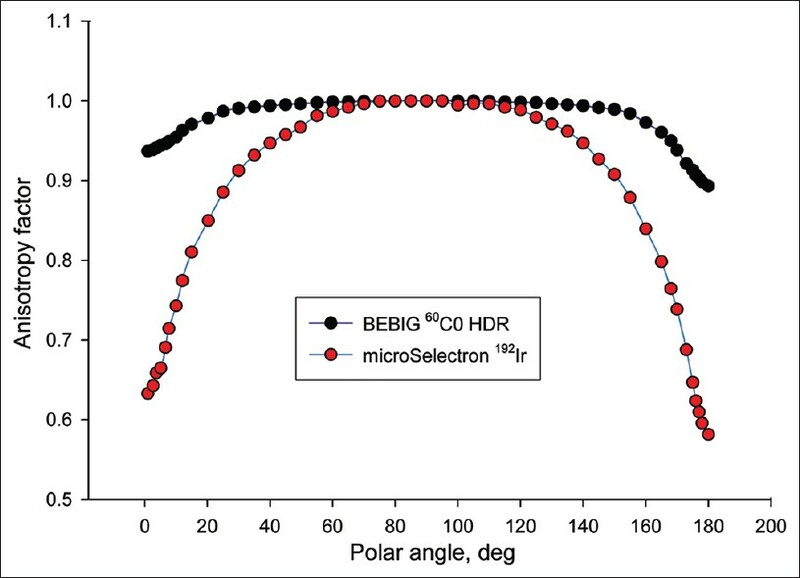 The values of radial dose function for distances up to 1 cm and more than 22 cm for BEBIG 60 Co HDR source are higher than that of other source. The anisotropic values are sharply increased to the longitudinal sides of the BEBIG 60 Co source and the rise is comparatively sharper than that of the other source. Tissue dependence of the absorbed dose has been investigated with vacuum phantom for breast, compact bone, blood, lung, thyroid, soft tissue, testis, and muscle. 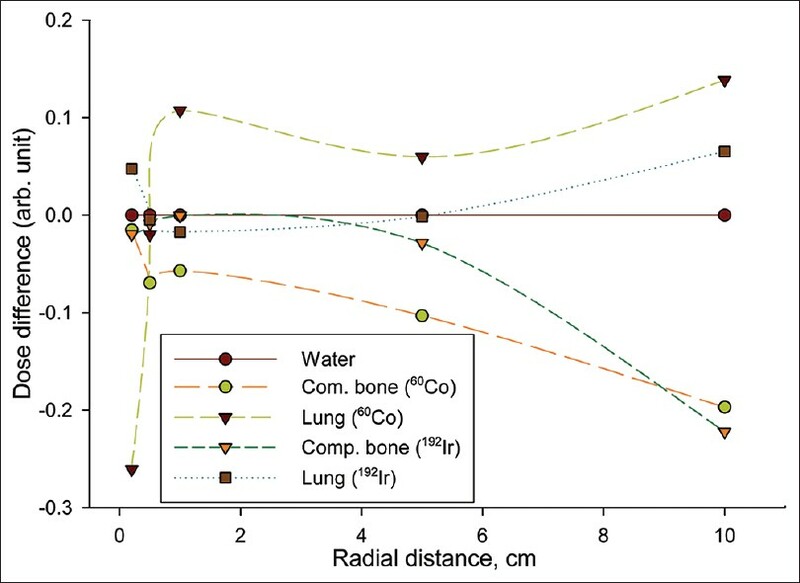 No significant variation is noted at 5 cm of radial distance in this regard while comparing the two sources except for lung tissues. The true dose rates are calculated with considering photon as well as electron transport using appropriate cut-off energy. No significant advantages or disadvantages are found in dosimetric aspect comparing with two sources. This study comprises EGSnrc  Monte Carlo based dosimetry in accordance with AAPM TG-43U1  protocol for new BEBIG 60 Co HDR source model Co0. A86 (Eckert and Ziegler BEBIG GmbH, Germany) and microSelectron HDR 192 Ir source model 105.002 "v2" (Nucletron, Netherlands). The aim of this study was to compare the various dosimetry parameters as well as TG- 43U1  parameters for two sources. Meanwhile, some authors have published the relevant dosimetry data with different methodology for both sources. Richter et al. have reported a comparison of 60 Co and 192 Ir sources using EGS-Ray  Monte Carlo based calculations and only photon emission has been considered for the simulations. Recently Selvam et al. have published EGSnrc  Monte Carlo based dosimetry data except anisotropy function for BEBIG 60 Co HDR source. Moreover, Ballester et al. and Granero et al. have reported GEANT4 based Monte Carlo dosimetry data in accordance with TG-43  formalism for the same source. On the other hand, Daskalov et al. have published dosimetry data for microSelectron HDR 192 Ir sources using MCPT Monte Carlo transport code. Collision kerma is used to approximate the absorbed dose calculation. Furthermore, Borg et al. and Taylor et al. , have reported TG-43 dosimetry parameters for same source using BrachyDose  EGSnrc based Monte Carlo transport code. In this work, the EGSnrc  Monte Carlo code system is used to calculate the TG-43  parameters with similar methodology for two sources. The true dose rates are calculated with considering photon as well as electron transport. The calculated radial dose function and anisotropy function values for both sources are compared. The calculated air-kerma strength and dose rate constant are compared with other published data for the sources. The absorbed dose is calculated in different tissues related to the same dose in water for both sources and the results are compared to estimate the relative heterogeneity effect. The microSelectron HDR 192 Ir source consists of pure iridium metal having density 22.39 g cm -3 . A source cylinder having diameter 0.065 cm and length 0.36 cm contains the radioactive 192 Ir material distributed uniformly inside it. 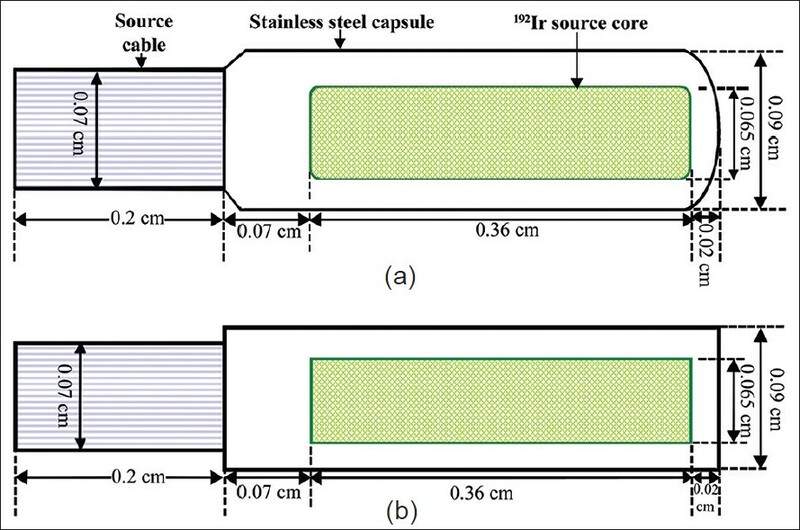 The source core is encapsulated with an AISI 304 steel capsule which has outer diameter 0.09 cm, inner diameter 0.065 cm, and length 0.45 cm and is connected to a 0.2 cm long steel cable having diameter of 0.07 cm. The thickness of the capsule on the opposite end of the steel cable is 0.02 cm and side of the iridium core toward the cable is 0.07 cm. [Figure 1]a shows the geometry of the real microSelectron-HDR 192 Ir v2 source whose model used in the Monte Carlo calculations is shown in [Figure 1]b. The cylindrical geometric model is an approximation of the real geometry of the sources. 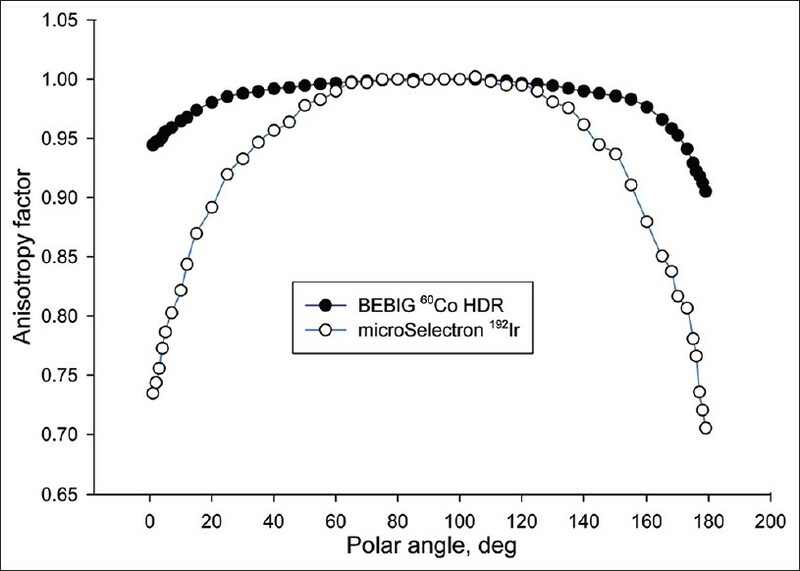 The BEBIG 60 Co HDR source consists of pure cobalt metal (density of 8.9 g cm -3 ) and is kept inside the source cylinder having diameter 0.05 cm and length 0.35 cm. Radioactive 60 Co material is uniformly distributed inside it. 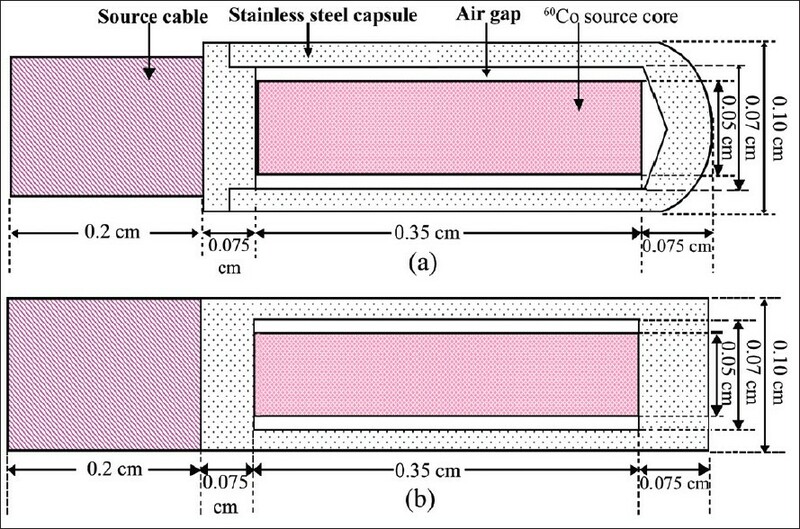 As of the previous case the source core is encapsulated, but now with an AISI 316L steel capsule (outer diameter = 0.1 cm, inner diameter = 0.07 cm). The capsule is 0.5 cm long and connected to a 0.2 cm long steel cable. The capsule thickness is 0.075 cm on the longitudinal sides of the 60 Co source core and the thickness of axial side is 0.015 cm. There is an air gap of 0.01cm around the axial side of the active source core. [Figure 2](a) shows the geometry of the real BEBIG 60 Co HDR source and [Figure 2](b) shows the model of it used in the Monte Carlo simulations. For the calculation of air-kerma strengths the sources are positioned at the center of a cylindrical container having 200 cm diameter and in dry air of mass density 0.001205 g cm -3 (pressure = 1 atm. and temperature = 20°C). Following the recommendation of TG-43 2 for absorbed dose calculations, the density of water was taken as 0.998 g cm -3 at 22°C. Several tissues are used as media for absorbed dose calculations. The ICRU density correction files  are used to make the pegs4 input files. 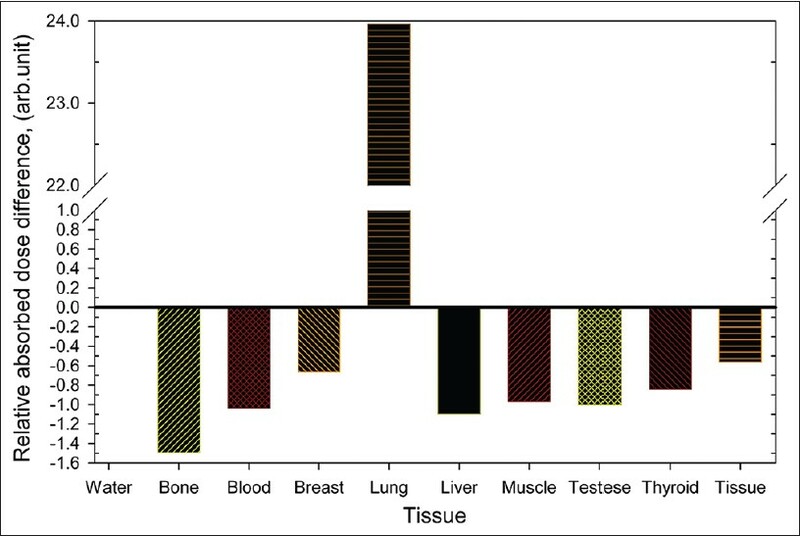 Some human tissue equivalent materials are shown in [Table 1] are simulated to investigate the absorbed dose difference for BEBIG 60 Co and microSelectron HDR v2 sources. The EGSnrc code system  used in the present work is widely accepted Monte Carlo simulation code for coupled electron-photon transport. Its current energy range of applicability is considered to be 1 keV to 10 GeV. It is an extended and improved version of the EGS4 package  originally developed at Stanford Linear Accelerator Center (SLAC). In particular, it incorporates significant improvements in the implementation of the condensed history technique for the simulation of charged particle transport and better low energy cross sections. In this study, the latest version of the code is used for calculations of photon fluence and absorbed dose to water. The half-life for 192 Ir is 73.825 days and as an average one-decay will result in the emission of 1 electron and 2.363 photons. The decay of 192 Ir radionuclide occurs through 4.7 % electron capture and 95.3 % β- transitions followed by γ transitions and k- and L-shells X-rays.  " 192 Ir_ bare_1993" spectrum and " 192 Ir_beta" spectrum are used as input photon spectrum and as beta spectrum respectively presented by Duchemin et al. for all Monte Carlo calculations of microSelectron_HDR 192 Ir source. The half-life of 60 Co radionuclide is 5.27 years and one-decay will result of emission of two photon spectrums with energy of 1.17 MeV and 1.33 MeV. The "bareco60" spectra file is used for all the subsequent Monte Carlo calculations of BEBIG 60 Co HDR source. The number of history used for all calculations is 10 9. The bound Compton scattering, PE angular sampling, Raleigh scattering and atomic relaxations are considered as transport parameters. Variance reduction techniques are avoided in the calculations. where, φ(E) [MeV -1 cm -2 ] is the photon fluence per unit energy at energy E [MeV] and is the mass energy-absorption coefficient at the same energy E. The factor 1.602 × 10 -10 is required to convert K air from MeV g -1 into Gy. Here, the unit of S k is denoted by the symbol U, and U = 1 μGy m 2 h -1 = 1 cGy cm 2 h -1 . The air-kerma per initial particle is calculated at a distance 100 cm from the center of the source as per AAPM TG-43 recommendation inside dry air medium. The mass energy-absorption coefficient, for dry air are taken from the latest NIST compilation. The user-code FLURZnrc  is used to calculate the differential fluence spectrum, φ′(E) in the calculation grid per initial photon in the simulation. The photon fluence spectrum in 5 keV  intervals was scored along the transverse axis for the point of 100 cm distance. The cut-off energy for photon and electron transport are 0.001 MeV and 2 MeV. In the present work, bare iridium source data (Ir192_bare_1993. spectrum) is used as spectra file for simulation to calculate the differential fluence spectrum for microSelectron HDR v2 source. The beta spectrum is not considered in the calculation of air-kerma strength in accordance with the TG-43 protocol. But both the spectra are used in the dose rate calculations for the source. Similarly, bare cobalt-60 spectrum (bareco60. spectrum) is used to simulate for the BEBIG 60 Co source in the calculation of air-kerma strength and also dose rate. To estimate the air-kerma strength, the source is kept in a 2 × 2 × 2 m 3 air cylinder and kerma is scored for a 0.2 cm thick and 0.1 cm high cylindrical ring cell, located along the transverse source axis. The number of 10  histories is simulated to obtain air-kerma strength for both sources. Whereas Borg et al. calculated air-kerma strength as same methodology for 50 cm distance for microSelectron HDR 192 Ir v2 source. Selvam et al. have calculated using same user code with photon fluence spectrum in 10 keV interval at 100 cm distance in a 1 cm thick and 0.5 cm height of voxel size for new BEBIG 60 Co HDR source. Moreover, Sahoo et al. calculated the air-kerma strength at 100 cm distance using MCNP code for new BEBIG 60 Co HDR source. where D photon is the total dose produced by photons, D electron is that due to electrons, S k/A is air-kerma strength per unit source activity in [U Bq -1 ]. The factor 3.6 × 10 5 is required to convert the dose rate per unit air-kerma strength per unit source activity in [cGy U -1 ] to the dose rate per unit air-kerma strength. The values of N p for 192 Ir and 60 Co are 2.363 ± 0.3% 9 and 2, respectively. 13 The true dose rate is calculated for all points of interest and these values are used to calculate TG-43 parameters  e.g., dose rate constant, radial dose function and anisotropy function. The cut-off energy for photon and electron transport are 0.001 MeV and 0.521 MeV, respectively, as maintained in the dose rate calculations for all radial distances. Daskalov et al. simulated for new microSelectron HDR 192 Ir source using MCPT based Monte Carlo transport code and collision kerma is used to approximate the absorbed dose, whereas secondary electron transport was not considered for calculation. Taylor et al. , have reported TG-43 parameter's value for same source using EGSnrc based BrachyDose  Monte Carlo transport code without considering electron transport. Granero et al. and Richter et al. calculated the dosimetry parameters using Monte Carlo based transport code GEANT4 and EGS-Ray,  respectively, for new BEBIG 60 Co HDR source and the authors used 10 keV cut-off energy in the simulation for photon and electron. Selvam et al. calculated absorbed dose to water using DOSRZnrc user code  of EGSnrc for the same source with cut-off energy 0.001 MeV and 0.521 MeV for photon and electron transport, respectively. The authors also calculated collision kerma to approximate the absorbed dose close to the source (up to 1 cm) and electron rage rejection technique (ESAVE =2 MeV) is used for rest of the calculations. The calculated value of air-kerma strength per unit source activity is found to be 9.698 × 10 -8 ± 0.55% U Bq -1 for new microSlectron HDR 192 Ir v2 source. The source is also simulated at the point of 100 cm distance from the source centre of a cylindrical air phantom. This value is in good agreement with results (=9.737 ± 0.009 × 10 -8 U Bq -1 ) obtained by Hong et al. at an average value from 2 to 50 cm distances with 0.2% contribution from bremsstrahlung. The extracted results at 50 cm distance without bremsstrahlung contribution was 9.694 ± 0.037 × 10 -8 U Bq -1 . The results also agree well with the observed results (9.71 × 10 -8 ± 0.4% U Bq -1 ) of Borg and Rogers  for air-kerma strength per unit source activity for the microSlectron HDR 192 Ir v2 source at 50 cm distance from the source centre. It's worth mentioning that thier methodology has been adopted in the present cases also. Dose rate constants, Λ, are calculated by dividing the dose to water per unit source activity in a (0.1 mm) 3 voxel centred at the reference position, (1 cm, 90°), in the π × 100 2 × 200 cm 3 cylindrical water phantom, by the air-kerma strength per unit source activity. The contribution of primary electron is accounted for in all the calculations related to microSlectron HDR 192 Ir v2 source. The value of Λ for microSlectron HDR 192 Ir v2 source is found to be 1.116 ± 0.12% cGy h -1 U -1 . This result agrees well with the result of Taylor et al. (=1.109 ± 0.18% cGy h -1 U -1 ) and Hong et al. (=1.112 ± 0.51% cGy h -1 U -1 ). The radial dose function, g L (r) accounts for dose fall- off on the transverse-plane due to photon scattering and attenuation in water medium. The function is also influenced by the geometry factor, G L (r, θ) and the anisotropy factor, F(r, θ). The geometry factor depends on the physical parameters of the source, i.g., the length and the radius of the source. An identical construction of of the sources can ensure same geometry factors. The isodose curve is influenced by the anisotropy factor in clinical dose distribution. These two functions are essential for comparing different brachytherapy sources. The [Figure 3] shows the comparison of radial dose functions from 0.06 cm to 100 cm radial distance and the [Figure 4] does the same for distance from 0.06 cm to 2 cm. The values of radial dose function for 60 Co source is about 2.4% lower than 192 Ir at 2 cm radial distance (Manchester Point A) and the values are also found to be lower 7.5%, 9.3% and 10.3% for the point of 5 cm, 7.5 cm and 10 cm respectively. The values of radial dose function of 60 Co source are also lower than that of the 192 Ir source in the range from 0.06 cm -0.17 cm. The values are, however, found higher in the range from 0.18 cm -1 cm and above 22 cm of radial distance. The higher values of radial dose function are found for 192 Ir source at the distance shorter than 0.17 cm may be the dose by electron contribution. The values are found to be less by 7% averagely using ECUT =2 MeV. The radial dose function for 60 Co source is linearly fall-off from 1 cm to 7.5 cm of radial distances. 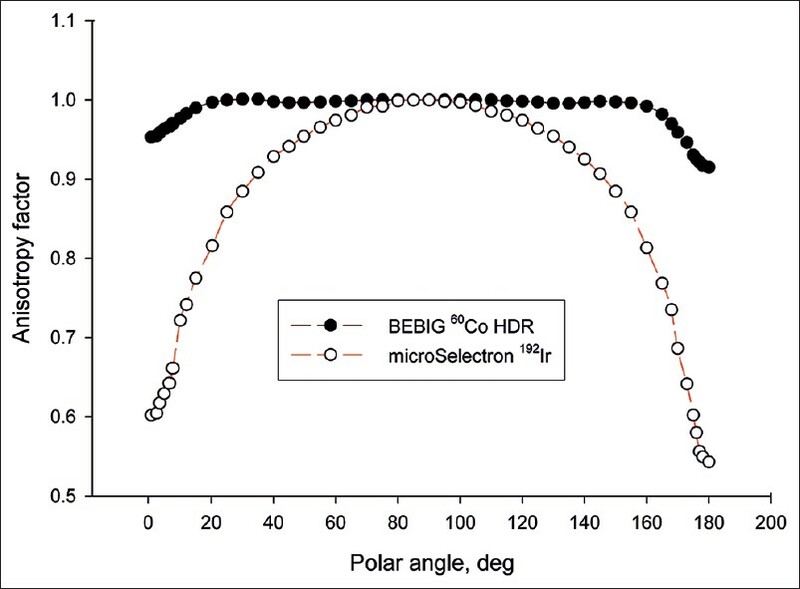 The anisotropy factors of BEBIG 60 Co HDR source are comparatively higher at the longitudinal sides of the source with the values of microSelectron HDR 192 Ir source. 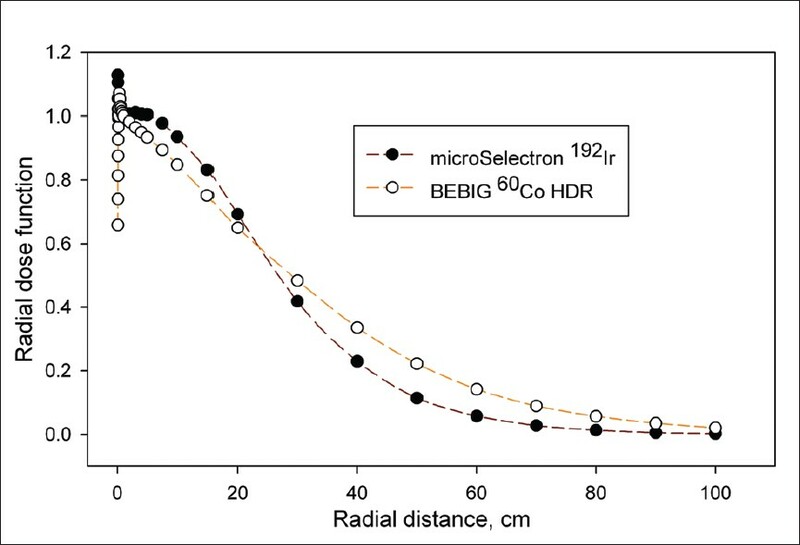 It is also sharply increases with the radial distances to the longitudinal side of the BEBIG 60 Co source comparatively with the value of microSlectron 192 Ir v2 source. These factors for the cable connecting side of the BEBIG 60 Co source are quite low compared to that of the other side and the values show an increase with the radial distance. The [Figure 5],[Figure 6],[Figure 7] and [Figure 8] compare the anisotropy factors for 2 sources at radial distances 1 cm, 3 cm, 5 cm and 10 cm. A cylindrical phantom was constructed with the respective tissue equivalent materials [Table 1] for simulation. The absorbed doses are calculated at different radial distances. The absorbed dose of water at discrete distances has been used as reference dose for the calculation of relative dose differences. The [Figure 9] shows the relative absorbed dose differences between 60 Co and 192 Ir sources. Significant dose differences are noted for compact bone tissue up to 8 cm and more than 10 cm radial distances. Maximal absorbed dose differences are, however, observed in lung tissue: The results being about 30.8% at 0.2 cm, and 12.45% at 1 cm. As is expected the difference decreases with increase in radial distances. Tissue dependence of absorbed dose has been calculated with vacuum phantom for water, breast, compact bone, blood, lung, thyroid, soft tissue, testis and muscle. 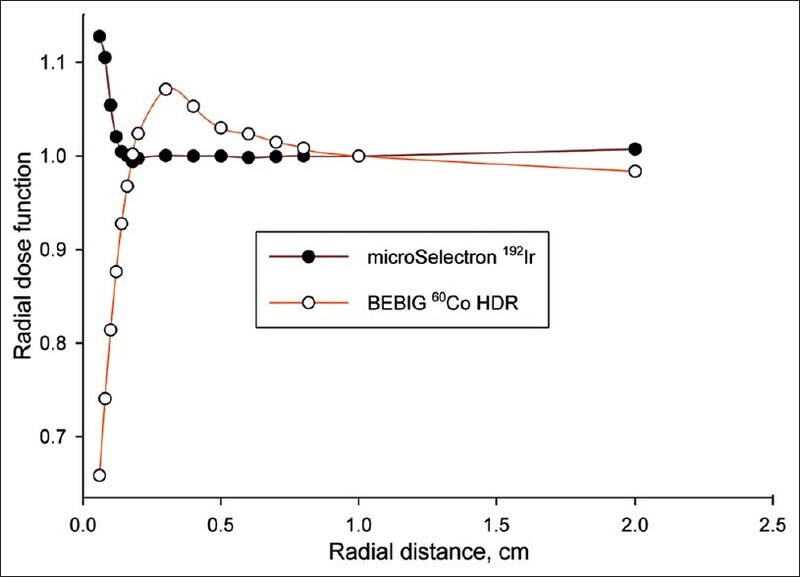 No significant tissue dependence in absorbed dose is noted at 5 cm of radial distance by comparing BEBIG 60 Co HDR to microSlectron HDR 192 Ir v2 sources except for the lung tissues. [Figure 10] shows the differences comparing them with the absorbed dose of water. The investigations of 60 Co and 192 Ir sources have shown approximately identical dose distribution. Negligible differences are noted in radial dose distribution as well as negligible absorb dose differences with various tissues. A significant difference appears in absorbed dose at the close surface of the iridium source (132 times higher than the dose of 1 cm of radial distance from the source centre)  probably due to the contribution of primary electron. These differences are minimal when the calculation is done with KERMA approximation. In case of 60 Co source, the absorbed dose is about 74 times higher  than the dose of 1 cm of radial distance. 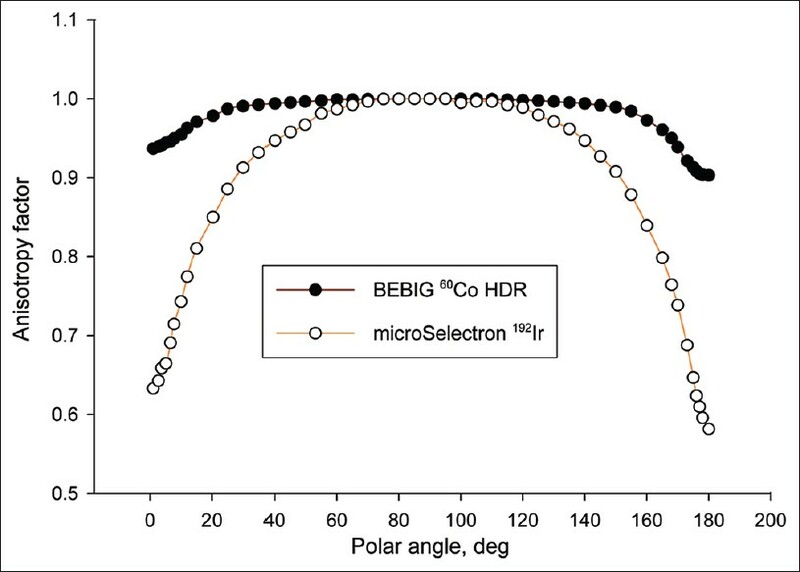 The values of anisotropy function at the longitudinal sides of the BEBIG 60 Co HDR source are relatively higher than microSelectron HDR 192 Ir source and the isodose lines will be not exactly identical due to this effect for these region. Treatment planning system performs to adjust the isodose distribution using dwell time positioning technology in clinical relevant situation. The radial dose function characterize the dose fall-off on the transverse plane of the source. The higher dose region for 192 Ir source and lower dose region for 60 Co source (<0.17 cm from the source centre) may be situated inside the applicators and rest of the region up to 1 cm, the radial dose fall-off will be dependent on the nature of the applicator. The applicators commonly use for cervical site; these region again may be situated inside the applicators. The differences of the radial dose function <1 cm for 2 sources may be effectual for narrow catheter based intracavitary or interstitial brachytherapy. The small difference of radial dose function (within the therapeutic range of radial distance) has a possibility to make a negligible difference in isodose distribution in clinical applications. The authors are grateful to Prof. Dr. Günter H. Hartmann, Dr. Mario Parez, T. Palani Selvam and Liu Hong for their valuable technical support and encouragement. 1. Rogers DW, Kawrakow I, Seuntjens JP, Walters BR, Mainegra-Hing E. "NRC user codes for EGSnrc," NRCC Report No. PIRS-702 (revB), National Research Council of Canada, Ottawa, Canada, 2010. 2. Rivard MJ, Coursey BM, DeWerd LA, Hanson WF, Huq MS, Ibbott GS, et al. Update of AAPM Task Group No. 43 Report: A revised AAPM protocol for brachytherapy dose calculation. Med Phys 2004;31:633-74. 3. Richter J, Baier K, Flentje M. Comparison of 60 Cobalt and 192 Iridium source in high dose rate afterloading brachytherapy. Strahlenther Onkol 2008;184:187-92. 4. Kleinschmidt C. EGS-Ray: Ein windows-programm zur schnellen modellierung komplexer geometrien in EGS-4. Medizinische Physik 99, H. Gfirtner (Hrsg. ), Dt. Ges. Für Medizinische Physik, Passau 1999;99:159-60. 5. Palani Selvam T, Bhola S. Technical note: EGSnrc-based dosimetric study of the BEBIG 60 Co HDR brachytherapy sources. Med Phys 2010;37:1365-70. 6. Ballester F, Granero D, Pérez-Calatayud J, Casal E, Agramunt S, Cases R. Monte Carlo dosimetric study of the BEBIG Co-60 HDR source. Phys Med Biol 2005;50:N309-16. 7. Granero D, Pérez-Calatayud J, Ballester F. Technical note: Dosimetric study of a new Co-60 source used in brachytherapy. Med Phys 2007;34:3485-8. 8. Daskalov GM, Löffler E, Williamson JF. Monte Carlo-aided dosimetry of a new high dose rate brachytherapy source. Med Phys 1998;25:2200-8. 9. Borg J, Rogers DW. Monte Carlo Calculations of Photon Spectra in Air from 192 Ir Sources. National Research Council, Ottawa, Canada, PIRS-629r; 1999. 10. Taylor RE, Rogers DW. EGSnrc Monte Carlo calculated dosimetry parameters for 192 Ir and 169 Yb brachytherapy sources. Med Phys 2008;35:4933-44. 11. Taylor RE, Yegin G, Rogers DW. Benchmarking BrachyDose: Voxel based EGSnrc Monte Carlo calculations of TH-43 dosimetry parameters. Med Phys 2007;34:445-57. 12. Yegin G, Rogers DW. A fast Monte Carlo code for multi-seed brachytherapy treatments including interseed effects. Med Phys 2004;31:1771. 13. Sahoo S, Palani Selvam T, Vishwakarma RS, Chourasiya G. Monte Carlo modeling of 60 Co HDR brachytherapy source in water and in different solid water phantom materials. J Med Phys 2010;35:15-22. 14. Kawrakow I, Mainegra-Hing E, Rogers DW, Tessier F, Walters BR. The EGSnrc Code System: Monte Carlo Simulation of Electron and Photon Transport. Ionizing Radiation Standards, NRC, Ottawa, Canada, NRCC Report PIRS-701; 2010. 15. Nelson WR, Hirayama H, Rogers DW. The EGS4 Code System. Report SLAC-265, Stanford Linear Accelerator Center, Stanford, Calif, 1985. 16. Duchemin B, Coursol N. Reevalution de l' 192 Ir. Technical Note LPRI/93/018, DAMRI, CEA, France, 1993. 17. Hubbell JH, Seltzer SM. Tables of x-ray mass attenuation coefficients and mass energy-absorption coefficients 1 keV to 20 MeV for elements Z = 51 to 92 and 48 additional substances of dosimetric interest. NISTIR, 5632. 1995. 18. Hong L, Zakaria GA, Hartmann GH. EGSnrc Monte Carlo- aided dosimetric studies of the 192 Ir microSelectron v2 HDR brachytherapy source. In: Doessel O, Schlegel W, editors. WC, IFMBE Proceedings 25/I, 2009. p. 341-4. 19. Anwarul Islam M. Dosimetric study for 192 Ir and 60 Co HDR brachytherapy sources using an EGSnrc Monte Carlo transport code. Ph. D thesis (under preparation), Department of Physics, Jahangirnagar University, Dhaka, Bangladesh; 2012. Anwarul, I.M., Akramuzzaman, M.Md., Zakaria, G.A.